From 2005 onwards, the show has toured internationally to festivals and venues, starting at the Israel Festival and Edinburgh Festival Fringe, and touring to various countries including England, China, Greece, Spain, Japan, India, HongKong, Macao and Laos. A long-term overseas tour is being planned in Japan and America in 2007. 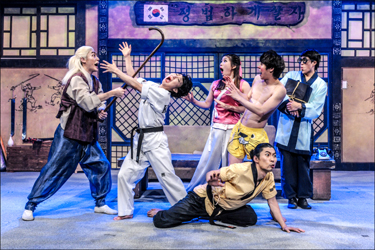 JUMP won the ‘Comedy Award’ at Edinburgh Fringe festival 2006, ‘Grand Prize for Drama & Musical’ by the Korean National Assembly and featured in ‘The Royal Variety Performance’ shown on BBV TV in December 2006. With three years of extensive training in acting and mime and more than 1,500 performances under their belts, the champion gymnasts and martial artists in the show have honed their skills to perfection. The concept for the show was first conceived in October 1999. The sixth scenario of the show CRAZY FAMILY was written in March 2001. Eight months later, the team started their acrobatics training under the guidance of Oak Soo Chung, the Women’s National Gymnastics team coach. In August 2002, the non-verbal performance of CRAZY FAMILY was previewed and the team was invited to perform at the Kyushu Festival in Japan. That same year, they premiered at the National Theater of Seoul. 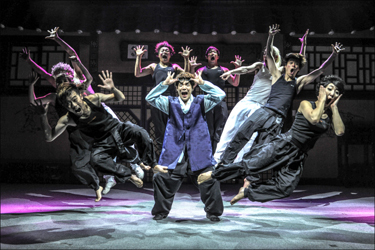 In April 2003, the show was renamed JUMP and performed to various theatres in Korea. 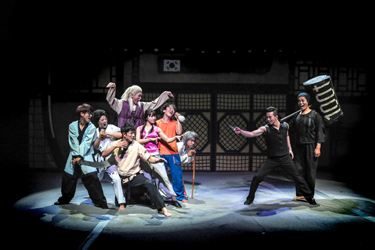 Now the show in running on at the ‘Jump Theatre’ built in Seoul in September 2006. From 2005 onwards, the show has toured internationally to festivals and venues, starting at the Israel Festival and Edinburgh Festival Fringe, and touring to various countries including England, China, Greece, Spain, Japan, India, Hong Kong, Macao and Laos. A long-term overseas tour is being planned in Japan and America in 2007. JUMP won the ‘Comedy Award’ at Edinburgh Fringe Festival 2006, ‘Grand Prize for Drama & Musical’ by the Korean National Assembly and featured in ‘The Royal Variety Performance’ shown on BBC TV in December 2006. – Please enter your hotel information (such as Hotel name, room number and hotel number) and E-mail address for efficient pick up on the tour day. – After the reservation, you will get a confirm mail about the pick-up time and tour information. If you didn’t get it in 3 days, please remind us to mail@koreatourinformation.com. – All the tour includes a tour guide, Transportation (except for walking tour) and admission fee. – If you cancel your reservation on the tour day, 100% cancellation fee will be charged. – In the morning tour, we drop off all guests at Seoul City Hall. – We have no responsibility for your personal incidents and losses during all the tour. – Pick up time might be changed depending on the traffic conditions. – All major credit cards are accepted in our travel agency.